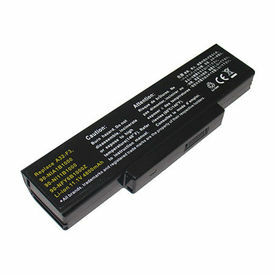 Buy CL Laptop Battery for use with Asus F2, F3, M51, Z53, MSI A600, SQU-503, SQU-511, SQU-524, SQU-528, SQU-529, SQU-601, SQU-706, SQU-718 Series online - Clublaptop - The largest online store by Manufacturer of Laptop Accessories and Spares. This ClubLaptop (CL) Hi-Life replacement Battery is made from High grade cells and highest quality parts. This CL brand replacement battery is 100% comparable to Original battery in all terms including its size, appearance and most important QUALITY. Each CL Laptop Battery has to pass strict quality control procedures including filtration and safety testing of voltage, capacity and battery core (body). Each battery also passes necessary authentication certifications like CE, ROHS etc. before leaving the factory, so you can be rest assured for its quality, durability and performance. NOW!!!! Carry your laptop anywhere and work, play or watch movies for longer hours without plugging in.